We are proud to announce the release of the Classic Motoring Accessories Newswire Gadget. 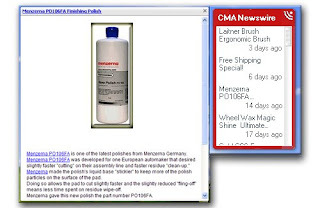 Our new CMA Newswire Gadget, a part of the Google Desktop interface, plugs you right into ProperAutoCare's news feeds. Now, you can have ProperAutoCare.com on your desktop. What this means for you is that you will know about new products, alerts on promotions and sales, before we go to press on our main site. You'll be subscribed to our feeds, without actually having to subscribe to our feeds. As you can see from the images below, the gadget takes up very little of your desktop's real estate. You can just tuck it up on a corner of your screen. Our Gadget resides on your desktop, delivering our feeds directly to you. When you click on a certain feed in the gadget, a window will pop out to the side of the gadget with the full story. Clicking on the feed link at the top of the popout window, will take you directly to the post. The gadget does not require you have a browser open. Clicking on a link within the story, will open your default browser and take you directly to our site. Once installed, Google Desktop and our Gadget will run automatically when you start your computer. Just follow this link to our gadget page to download Google Desktop and our Gadget. Technology can be a wonderful thing!